I am always very very happy when I meet up these ex colleagues of mine. We make the effort to meet at least once a month to update each other over food. I am very thankful to have them for its really nice to have real friends who really cares about you and gives you support when you need it. 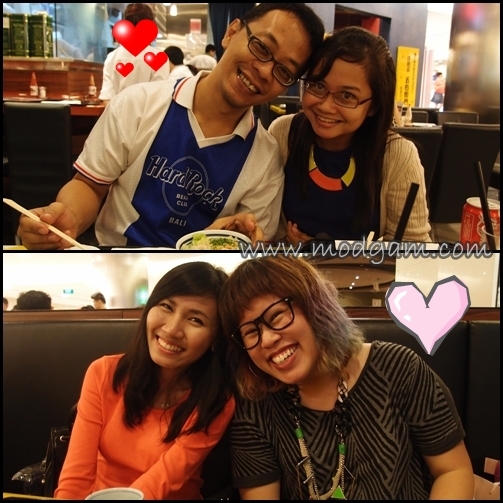 Been so busy juggling work and blogging that I sometimes doubt myself and feels overwhelmed, but they keep me sane. Its really awesome to know my true friends are still there cushioning me. 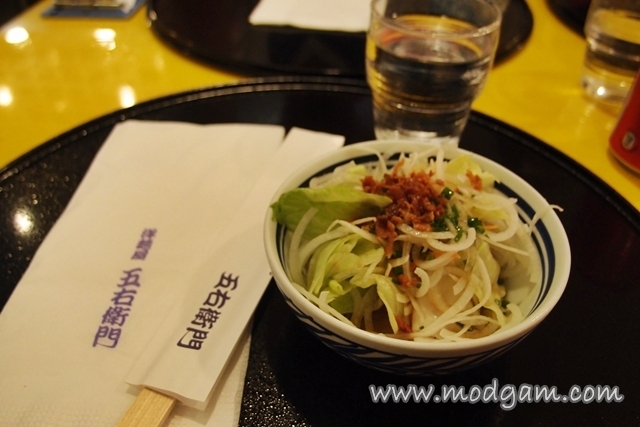 This Japanese restaurant is located at the side of Citylink Mall walkway and despite it being so open, the whole décor looks comfy and the aroma from all the cooking quickly lures you into the queue. The loving couple and the trying to be loving babes. LOL I call this picture, they stick, we stick. Every main dish you ordered comes with a bowl of fish essence. Yati and I ordered the set meal consisting of the fish essence soup, a drink, a bowl of salad, a main dish of our choice plus dessert for S$23.00. Pretty good deal if you ask me. 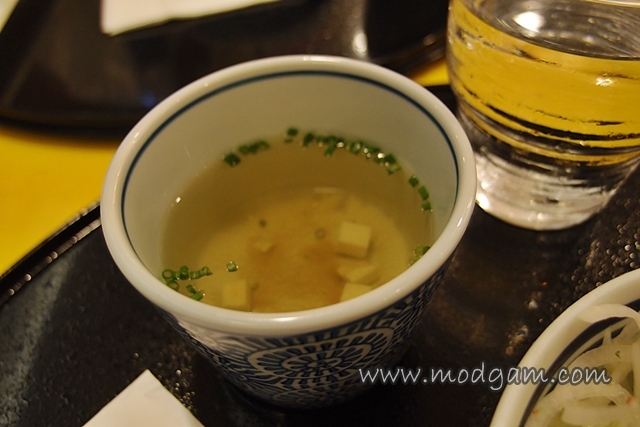 Fish essence soup – taste pretty much like the average miso soup? Salad – Crispy bacons and crunching veggies. Addictive salad sauce that makes you want more. 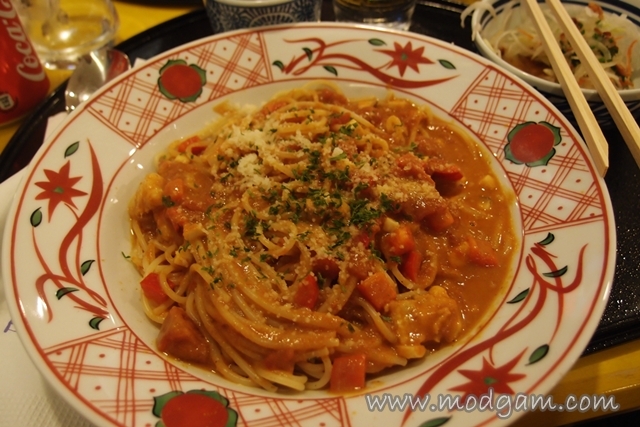 Lobster Bisque Soup Spaghetti S$15.50 – since soup is included with every main dish ordered, Yati and I added another S$7.50 for salad, drink and dessert! Value for money! Big serving and a little too much for us ladies. Not that I’m complaining since I kinda manage to finish 90%. As delicious as it looks! 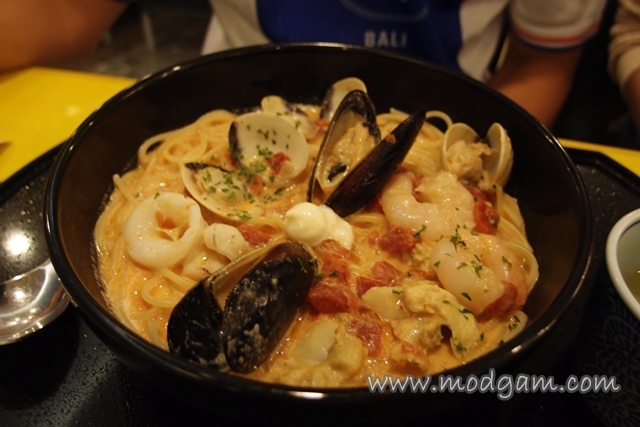 Mediterranean Tomato Cream Soup Spaghetti with Fresh Seafood S$14.50 – Tasty and generous servings of seafood; mussels, squid, prawns and clams. 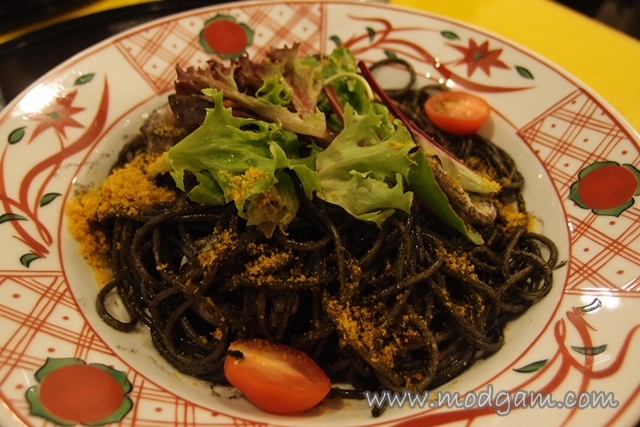 Squid Ink Spaghetti S$14.50 – This is one of the rare ‘will-not-be-stained’ squid ink pasta! I cannot believe when my babe insisted till I see and tried it. I’m sold. You can have your cake and eat it! more reasons for you to spend longer time here in sg. YEY! a while back, i was smiling. now after reading your reply to my comment, i was laughing without sound (imagine that!) hahaha! no need to apologize, mag! but I LOOOOOOVE JAPANESE! …excuse me, i have to wipe my keyboard; i just drooled! hahaha! LOLLLLLL woah…. laughing without sound, HIGHEST LEVEL OF Laughing! hahhaaaaaaaaa me tooooo i can eat japanese 24/7, 7/24 just like desserts! 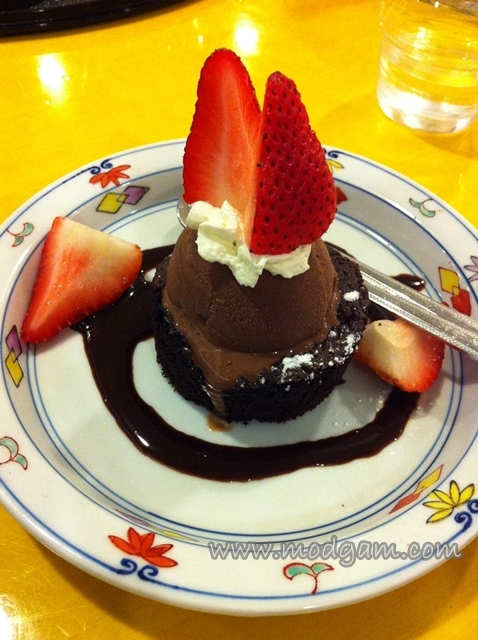 hahahaaaa drool no more, come by again… this time we do all things japanese! gabby likes japanese? 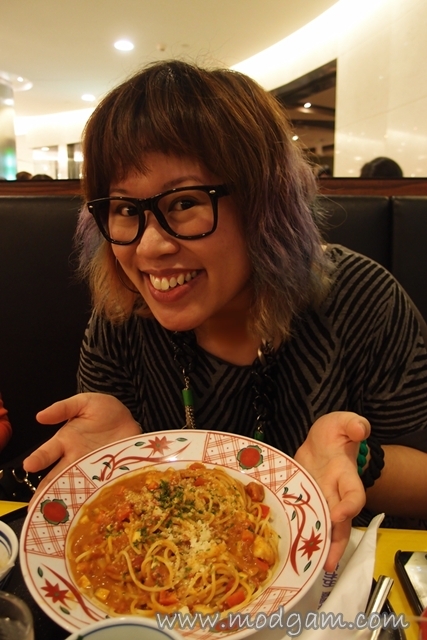 ebi and kani tempura are tina and gabby’s favorites!